Banana plant (plantain) like the coconut tree is blessed such that almost all its parts are useful in one way or the other. The outer most stem is chopped off as soon as the Banana bunch is cut off from it. It will be pealed into thin layers and on drying in the sun will turn into a wonderful thread and on dipping into water is used to tie flowers (or even vegetables) especially in the coastal regions of Karnataka which is called Bale Naru (Kannada) or Vayu (Konkani). 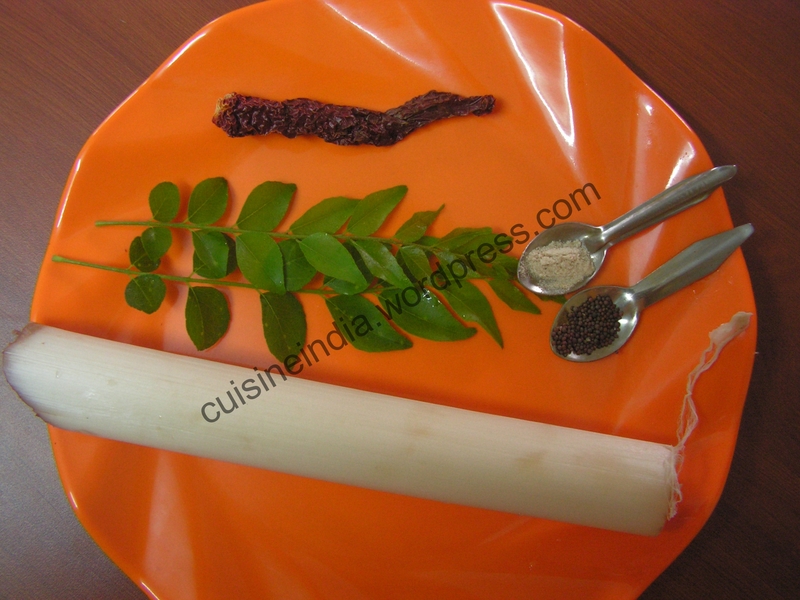 The innermost part of the stem is called Gabbo (Konkani) or”Baledhindu”(Kannada). It has high fiber content and medicinal value. 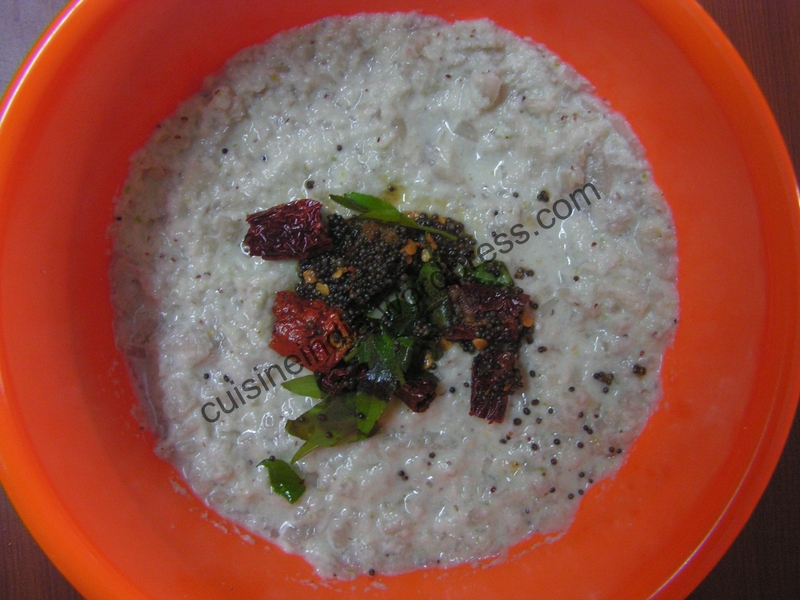 This Bharith I am putting up today is a great combination with rice and dal too. 3. In a mixer bowl add grated coconut, fried green chili, bilimbi, mustard seeds adding little quantity of water and grind to a medium fine consistency. 4. Add the ground mixture to chopped stem and also a little water to adjust the consistency. 5. Place a spatula with 1 teaspoon of cooking oil in it on low flame. When heated mustard seeds to it. When it splutters, add red chili pieces, asafoetida powder and finally curry leaves to it. Season it to the dish. Enjoy with rice and dal. Yum ! 1. Remember to chop off all extra fiber from the veggie. 2. This dish is best suited for summer as it is consumed raw. 3. Banana stem should be fresh and tender will be best suited. 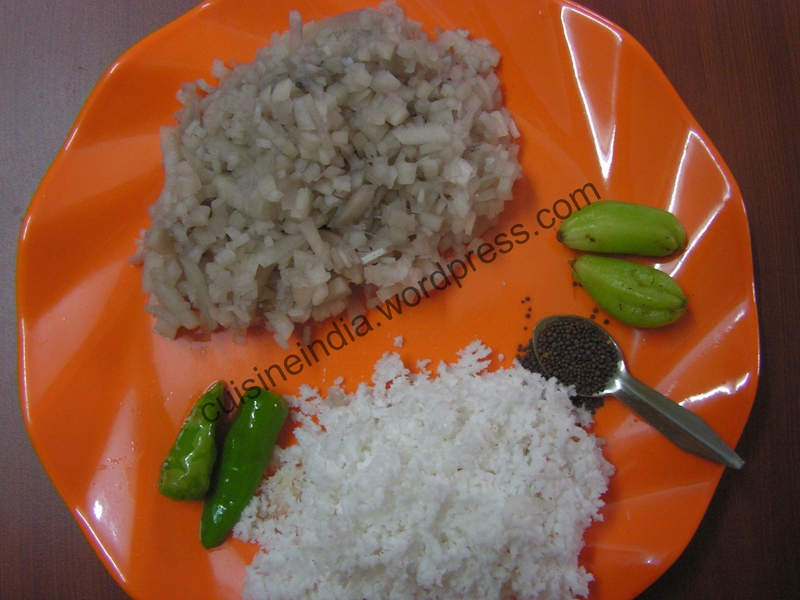 This entry was posted in Uncategorized and tagged Konkani dishes, Summer food. Banana needs no introduction since it is universally available fruit through out the year. Banana in English is Kele in Konkani and Balehannu in kkannada. The vegetable banana is used to prepare a variety of dishes and this variety of the banana for this recipe is called ‘Kat Bale‘ which is available in plenty in central part of Karnataka in places like the Hubli, Dharwad. It has a very thick skin and becomes sweet on ripening. I got this variety from our garden and thought of preparing spicy Banana Papad when it is raw. The recipe is very simple and easy to prepare. We can roll it with the rolling pin at night and dry it the next day in the strong sun during the afternoon for about 2 hours and store it in air-tight containers to enjoy it on a cold chilly day during the rainy season. One can prepare this papad with the usual Raw Banana veggie as well. I will try it out and put it up in the next summer season. In konkani we call it” Kele Happolu”. 1. Cook the fresh raw bananas in the cooker in water for about 20 minutes as usual and peal it. 2. Peel it and grate the cooked Bananas and is as shown in the image below. 2. Grind chilli powder, asafoetida, salt in the mixer, adding water in steps to make a thick paste. Prepare the required quantity of masala and of this add only 3 Teaspoons of this wet masala to prepare the papad with 4 raw bananas. 3. Pass the grated bananas from step-2 and also the chilli masala from step-3 into the bhujia mould together without adding water so that it mixes properly. 4. Dry beaten rice in the sun for about an hour and powder it in the mixer to a fine consistency. 5. Mix the masala mixed banana mixture into a soft pliable dough. Pinch out a small quantity of the dough and shape it into small balls. Dust the balls in the beaten rice powder and roll superficially with a rolling pin to required thickness. One has to roll the rolling stick also with thick plastic sheet and roll the papad on a plastic sheet superficially. Dry it in the hot sun for about an hour till it puffs up. 1. Use raw and fresh bananas for taste and quality and also crispness. 2. Do not add water at all while kneading the dough. 3. Dusting it in beaten rice powder while rolling, will make the papad turn crispy and tasty. 4. Roll it superficially taking care to see that papad retains its round shape . 5. It should be dried in the hot sun for only one hour till it puffs up. This entry was posted in Uncategorized and tagged 45 minutes, Fried snacks, Lunch side dish, Spicy snacks, Summer food.